The leader of a battalion involved in the killing of 24 Iraqis in Haditha should face a court-martial for dereliction of duty, the investigating officer recommended in a report obtained by The Associated Press on Wednesday. 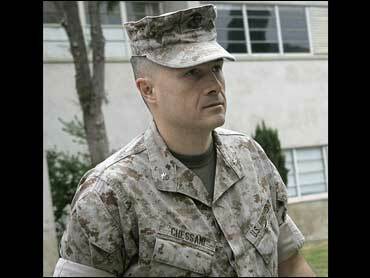 Lt. Col. Jeffrey Chessani, 43, was charged in December with dereliction of duty and violation of a lawful order for failing to report and investigate the deaths of the men, women and children in the biggest U.S. criminal case involving civilian deaths to come out of the Iraq war. The investigating officer, Col. Christopher Conlin, wrote that Chessani should face all charges. "Lt. Col. Chessani failed to do his duty," Conlin wrote. "He failed to thoroughly and accurately report and investigate a combat engagement that clearly needed scrutiny." The report was provided to the AP by a defense lawyer who asked to remain anonymous because other attorneys in the case had not yet seen it. Chessani's defense attorney Brian Rooney did not immediately respond to a phone message. The decision followed a setback for the government in its case against another defendant. A hearing officer found prosecutors lacked sufficient evidence to court-martial Lance Cpl. Justin L. Sharratt, who was accused of fatally shooting Iraqi civilians. Lt. Col. Paul Ware said murder charges brought against Sharratt for killing three Iraqi brothers in November 2005 were based on unreliable witness accounts, insupportable forensic evidence and questionable legal theories. Furthermore, he said, the case could have dangerous consequences on the battlefield, where soldiers may hesitate during critical moments when facing an enemy. "The government version is unsupported by independent evidence," Ware wrote in an 18-page report released Tuesday by Sharratt's attorneys. "To believe the government version of facts is to disregard clear and convincing evidence to the contrary." Prosecutors allege Sharratt and other members of his battalion engaged in a revenge-motivated assault on Iraqi civilians after a roadside bomb killed a fellow Marine. Sharratt contends the Iraqi men he confronted were insurgents and at least one was holding an AK-47 rifle when he fired at them. "Whether this was a brave act of combat against the enemy or tragedy of misperception born out of conducting combat with an enemy that hides among innocents, Lance Corporal Sharratt's actions were in accord with the rules of engagement and use of force," Ware wrote. He said further prosecution of Sharratt could set a "dangerous precedent that ... may encourage others to bear false witness against Marines as a tactic to erode public support of the Marine Corps and its mission in Iraq." He added, "Even more dangerous is the potential that a Marine may hesitate at the critical moment when facing the enemy." The recommendations by the investigating officers for both Chessani and Sharratt are nonbinding. Final decisions about whether they should stand trial will be made by Lt. Gen. James Mattis, the commanding general overseeing the cases. At Chessani's preliminary hearing, several witnesses testified that Iraqis had complained to Chessani soon after the killings and that he promised to look into what had happened. In the only other preliminary hearing in the Haditha case, an investigating officer recommended dereliction of duty charges against Marine lawyer Capt. Randy W. Stone be dealt with administratively. Besides Sharratt, two other enlisted men are charged with murder. Four officers are accused of failing to investigate the incident.